You have probably been wondering where I have been & where my analysis of the full Batman trailer is. Well I’ve been spending every free second pouring over the Bat phone! 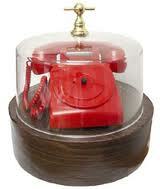 No not Batman’s red retro hotline to Commissioner Gordon, although that is pretty cool though. 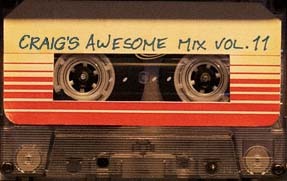 Rewind! Freeze! Hopefully you had a chance to skim my post the other day regarding my recommendations for this years most wanted gifts. I hope it helped with any last minute shopping you had to squeeze in. Well I know at least one person read that post using his North Pole wireless network. If you did read that post you would have noticed that the second or third item on my list was The Dark Knight Rises Nokia Lumia 800 or as I like to call it The Bat Phone. I’m not going to into detail about my obsession with Batman or gadgets and whether they may be linked. But I am the guy who purchased the Nokia 9000 Communicator just because The Saint (Val Kilmer) used it in a film. The 9000 gave me more joy than the film did. So you can imagine my astonishment and child like glee when one was delivered to The Establishing Shot. I say one - but really I should labour the point that there are only 40 of these numbered Nokia Lumia 800 phones in the world. That means that only 39 other people on the planet will share in this particular pleasure. I have been using it for 2 days and it has taken some adjusting from my iPhone but I’m probably not looking back. When reading the following please bear in mind that I've only had the phone for a couple of days so haven’t got a full grasp of all the functionality and features yet. The Establishing Shot: Nokia Lumia 800 Dark Knight Rises Batphone Package, a photo by Craig Grobler on Flickr. 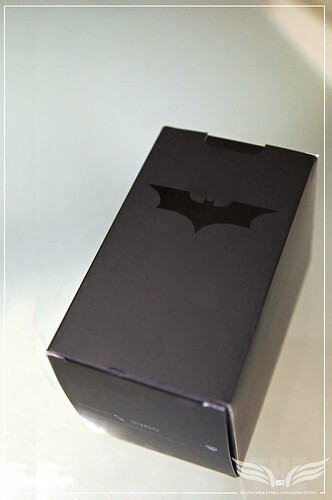 Opening the matte black box emblazoned with a single subtle bat symbol, revealed a slide out box within. 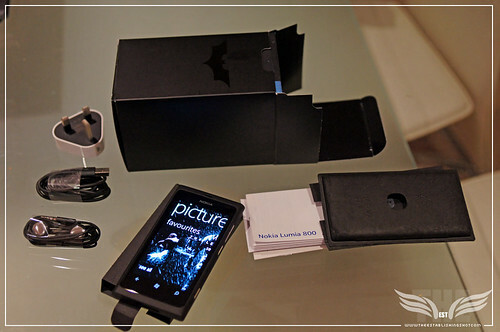 The Nokia branded inner box housed the black Nokia Lumia 800 Dark Knight Rises Edition or the Nokia Lumia Rises as it is named in the system. 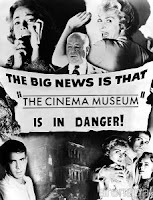 The Establishing Shot: Nokia Lumia 800 Dark Knight Rises Bat phone box contents, a photo by Craig Grobler on Flickr. A panel underneath contained a protective rubber bat sleeve or bat armour (I believe the standard Nokia Lumia 800 gets a soft cover) and another panel with start up guide & paperwork. At the bottom of the box the inlay was divided into three, containing; a USB power plug, a black headset (I was impressed to find that the Nokia Lumia 800, comes with noise cancelling functionality as standard) and a USB cable. Neat and simple. On the back of the phone is the single most defining physical feature for me; the bat logo engraved into the back of the phone. It feels very comfortable in my hand and the curved edges feel almost organic. Slipping it into its body amour I appreciated that the designer had thought about this – as the body armour had its own pressed Bat symbol. Above the symbol the camera’s Carl Zeiss f/2.2 lens and a Dual LED flash. The Nokia Lumia 800 was slightly longer (116.5mm) than my existing phone but slimmer (12.1mm) and thinner (61.2mm), even with the form fitting body armour on. It feels sturdy and ultra light as you would expect from injection moulded polycarbonate. It looks and feels like something the Batman would carry. I’m just saying. The 3.7 inch, AMOLED touch screen seems fairly large, a Nokia logo on the top and three lit up touch screen buttons on the bottom: back (or show all open applications), home and Bing search. On the side four elegant silver buttons. From top to bottom: volume up & down, the power switch and sadly the fourth button did not release the shark repellant or grappling hook but takes up to 8 MB photos or 720 x 1280p video. Hence the recent surge in pics being uploaded to Facebook and twitter. On the bottom a subtle speaker and on the top a headphone jack and a pop out slot for your micro SIM card. I push the power on button and the Lumia fires up. It takes a bit of getting used to - as you would expect when moving across to a different operating and navigation system. But once I get my head around it I can’t believe how easy and quick it is. Windows Phone 7.4 Mango operating system makes the Lumia really quick - flicking between apps and screens even with multiple apps open. 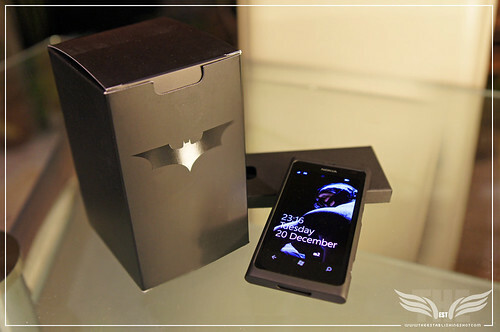 The Establishing Shot: Nokia Lumia 800 Dark Knight Rises Batphone & Packaging Bane Screen Lock, a photo by Craig Grobler on Flickr. The Start screen is a visually engaging customizable “home” screen made up of dynamic tiles - connecting and updating based on your pinned choices - network (facebook, Window Live, Twitter, Linked etc.) and communication choices; Internet Explorer, multiple emails, calls, etc. Or whatever you would like to add to the screen like maps, camera, pictures, calendar or any of the 100s of downloadable apps available. Download an app and pin it to your start screen. The aim here seems to be easy access to your online world and merging it with you real world. Flicking left takes you to the apps & settings screen. Where all your downloaded apps and setting are stored. Everything is accessed from these two screens and launches into their own hierarchy of screens. Apart from the engraved bat symbol the Bat phone has been customized with a live TDKR tile with easy access to any The Dark Knight Rises updates. Once I got an alert that the new The Dark Knight Rises trailer had been released I was able to click through and watch the trailer. The Dark Knight Rises trailer at 480p QuickTime was everything it should be crystal clear and the contrast spot on with the blacks coming across as a polished Batmobile (that is very black). The only down side here was that whilst streaming the trailer the video frame rate was a little fast, no doubt once cached the video would play at the correct speed. Again the speed of access impressed me. In fact both navigation and online activity are super fast. Annoyingly my existing phone is with the same mobile carrier but not where near as fast online. I’m referring to signal connection as opposed to Wireless. We also got all the officially released Dark Knight Rise posters as well as a Bane screensaver/lock wallpaper which still startles me a little bit every time I unlock the phone and Bane peers back at me in distain. So far I’m really enjoying the phone once I got my head around operating it - I do make this sound like it was difficult but quite the contrary I’m just so used to having to learn how to be intuitive so I can use intuitive interfaces that it’s tricky moving to something so simple. Flick click, flick, click. Its simplicity and paring down of navigation options is liberating - matching that with its speed makes using my new phone a pleasure to use rather than something that takes up brain space and time to navigate. It is also very elegant looking which is important to me as well a feels sturdy enough to take a knock or two. As I mentioned previously the interface is super quick and easy but please Nokia add on some more theme colours particularly neutrals and darks – this is the Bat phone and I can’t have its polished obelisk darkness sullied by all those bright primary colours more suited to The Joker phone. I may post more about the Nokia Lumia 800 as I learn more functionality and download apps.